The Scottish American Society of the Quad Cities, in conjunction with Picture Perfect Travel is proud to announce that it is again sponsoring a custom tour of Scenic Scotland, including tickets to see the world-famous Edinburgh Military Band Tattoo! Tour departs: August 22 – September 1, 2019! Inclusive tour with C.I.E. Travel includes exclusive transport by luxury motorcoach with driver and dedicated tour director. For details, please download our tour brochure and reservation form! 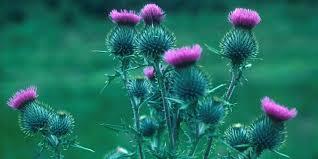 The thistle is the National Emblem of Scotland. Legend says that in the Battle of Largs in 1263, Norway's King Haakon invaded Scotland. Seeking to attack by stealth, the King instructed his soldiers to remove their footwear. The shrieks of pain from one soldier after stepping on a thistle woke the Scotsmen, who were able to repel and defeat the invading army. The Order of the Thistle is the highest honor that can be awarded in Scotland. The Order was created in 1540 by King James V.